Do You Need to Learn More About Peripheral Neuropathy? City Centre Health Edmonton Chiropractic is proud to offer tailored treatment for peripheral neuropathy, from our experienced chiropractor, Dr. Niz Saab. Take a look at our frequently asked questions below to learn more about our service. And if you have more questions, please call us. We can help! Why does peripheral neuropathy occur? The great news is, we can get you relief from the suffering you’ve experienced. 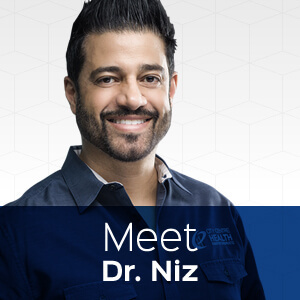 Dr. Niz’s years of expertise treating peripheral neuropathy have led to the creation of our exclusive program that gets great results. I’ve been told that there isn’t any solution to nerve damage. What makes your treatment different? It’s commonly thought that there’s nothing that fights the pain and discomfort of nerve damage. Don’t resign yourself to pain — there is relief available. Our advanced K-Laser is proven to help pain and symptoms of peripheral neuropathy. The laser penetrates deep, soothing the problem area. Oxygen, water and nutrients are drawn to the site, creating an optimal environment for healing. The peripheral neuropathy program at City Centre Health Edmonton Chiropractic is drug-free, painless and noninvasive, with no known side effects and boasting a high success rate. Research on laser therapy shows faster, more efficient results than many other options. There are over 2500 research papers that demonstrate the success of laser treatment. The deep penetration of the laser allows for a faster treatment, putting an end to your pain quickly. Some experience some form of relief after just one visit! Don’t suffer any longer. Reach out to us today!